CEO Andhra Telangana New Voter Enrollment Programme and Correction of Errors in Voters List Programme 2018 is going on upto October 31, 2018 in Telangana only not in Andhra Pradesh. 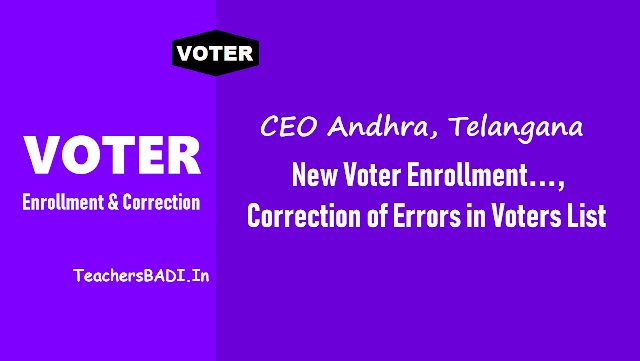 ceoandhra, ceotelangana, voter id,epic card,voters enrollment, Correction of errors, Voters list, electoral rolls, Election Commission of India, State Election Commission, ECI, District observers. The Commission announced revised schedule for the special summary revision of the electoral rolls. As per the new schedule, the final publication of electoral rolls will be done on October 10. Earlier, it was December end. In an official release, Telangana State Chief Electoral Officer Rajat Kumar said that the commission will publish integrated draft electoral rolls on September 10. The last date to file claims and objections is September 25. Disposal of claims and objections will be completed by October 4. Before October 7, the commission will update database and printing of the supplement. The official said that in the wake of premature dissolution of State assembly, the commission decided to stop all the activities relating to ongoing special summery revision of photo electoral rolls with reference to January one 2019 as qualifying date with immediate effect. Under the new schedule, January 1, 2018 is the qualifying date (18-year completed) to register votes. Sourse: PTI. ప్రజాస్వామ్య దేశం లో ఓటు ప్రతి ఒక్కరి హక్కు: ఓటు హక్కు ను ప్రతి ఒక్కరు సద్వీనియోగం చేసు కోవాలి. జనవరి 1 , 2018 వరకు 18 సంవత్సరములు నిండిన యువతి యువకులందరు ఓటర్ల జాబితా లో ఓటర్ గా నమోదు చేయించుకోవాలి. యువత వోటర్ జాబితా లో తమ పేరు ఉందొ లేదో తెలుసుకోవడానికి www.nvsp.in లో చూసుకోవాలి లేదా సంబంధింత బూత్ లెవెల్ అధికారిని సంప్రదించగలరు. పేరు లేనిచో ఓటర్ గా నమోదు చేసుకొనుటకు మూడు మార్గాలు కలవు. 1. సంబంధింత బూత్ లెవెల్ అధికారికి వివరాలు అందించాలి. 2. సంబంధింత తహసిల్దార్ కార్యాలయం లో Form 6 ను దరఖాస్తు చేసుకోవాలి. 3. Online ద్వారా ceotelangana.nic.in వెబ్ సైట్ లో నమోదు చేసుకోవచ్చు. In the wake of premature dissolution of State Legislative Assembly of Telangana, under Article 174(2) (b) of the Constitution of India, on 6th, September 2018, the Election Commission of India, after taking all aspects into consideration and the law laid down by the Hon'ble Supreme Court in the matter of Special Reference No.1 of 2002, has decided to stop all the activities relating to ongoing Special Summary Revision of Photo Electoral Rolls with reference to 01/01/2019 as Qualifying date in the State of Telangana with immediate effect and also to order 21 Special Summary Revision of Photo Electoral Rolls with reference to 01/01/2018 as qualifying date in the State. అక్టోబర్ 8 : తుద ఓటర్లి జాబితా ప్రచురణ. 3. A Copy of the order issued by the Hon'ble Election Commission of India is appended for giving wide publicity. Election it is the process which changes the fate of one's country and at the same time the fate of a Politician. India is a secular country and our constitution gives the right for people to choose the right for people to choose the right or good leader. "By the people, of the pole, for the people" It shows the Importance of Secularism of our country. The youth and students who attain 18 years to enrol themselves as voters. The youth can lead the country on the path towards prosperity. “Right to vote is a valuable weapon in the hands of people. It is everyone’s duty to create awareness among the people on the right to vote. Particularly the youth on attaining 18 years should enrol themselves as voters and secure voter ID cards. As January 25 is celebrated as National Voter’s Day, to create awareness among the youth on value of the vote. A good citizen feels for the political conditions situated in a country, But It is alone not enough he/she have to be a part of the elections. A person have the right to talk when he takes part in election. Vote is the weapon of a citizen to elect the right person. So, wake up and enroll for your electoral. According to the state election commission, the voter enrollment programme is going to be held from 1st September to October 31. Those who crossed 18 years up to 01-01-2019 are eligible to enroll their names for Voter ID. 2. This enrollment process is going to be done through E-Registrations. 3. Verifying will be completed by October 31 for those who have already applied and going to apply from. 4. Eligible voters will be issued Smart Identity Card. The schedule for the revision of electoral rolls is as follow.